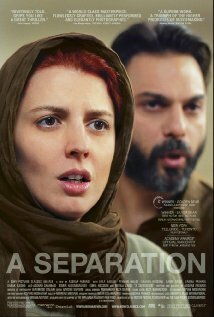 Our Academy Award Winning Foreign Films for this week is A Separation. A Separation is about how a married couple survived the biggest test in their marriage right before their divorce is finalized. I think it is no less than genius for someone to show how love can really pull through even when two people are about permanently stay apart. It's a clear message for me, love has nothing to do with marriage and it has nothing to do with whether or not two people are together. If there is love and if love is real, you will always be ready to count on it. It may not be in the way you want it but it will pull through. Simin has been married to Nader for 15 years. They have an 11-year-old daughter Termeh. When Nader refuses to leave Iran with Simin and Termeh as they originally planned because of his father suffering from Alzheimer's Disease, Simin files for divorce and moves back to her parents house. Nader hires a caregiver for his father, a pregnant poor woman with a hot tempered husband. Nader didn't know that the caregiver didn't ask for his husband's permission which was a requirement in Iranian law and religious belief. It is the caregiver and her complicated family set up that brings problems to Simin and Nader. While separated, Simin finds herself unable to turn her back on Nader. As such, they face the biggest struggle that has ever tried their marriage. Oddly enough, it happened when they were separated. It's is no wonder how A Separation ended up being one of the few Academy Award Winning Foreign Films. The direction was no less than genius. The living conditions and prevailing social and political condition is Iran have the tendency to make the audience feel strange and detached. They have a different court set up and the way their religious belief is so tightly intertwined with their political system make it difficult to gain sympathy. However, writer and director Asghar Farhadi was able to focus on the universal aspects of the complicated story that allowed it cut across all boundaries. Although the problems were brought upon by the unique social set up of Iran, the consequence to the characters remains a story of love, respect and family. Interestingly enough, Farhadi's focus on different universal themes allowed the movie to subliminally show the unique life in Iran with no judgment or biases. It was able to clearly give the audience an idea on the kind of life different social classes live in Iran, how the the city looks and how it generally feels to be in the country. The story is set in Iran, a country with strict censorship rules and highly conservative social and religious beliefs. Many think that the boundaries of the country deter it from growing its art industry. This movie proves art knows no boundary. Come back for more Academy Award Winning Foreign Films.